Info: Current Terminal trapping is on. Info: Global LLDP is enabled successfully. Nov 27 2012 16:16:37 Quidway LLDP/4/ENABLETRAP:OID: 1.3.6.1.4.1.2011.5.25.134.2.1 Global LLDP is enabled. Info: Setting management address successfully. Copyright (C) 2003-2010 Huawei Technologies Co., Ltd.
Nov 27 2012 16:19:26 Quidway SNMP/2/IF_PVCDOWN:OID 1.3.6.1.6.3.1.1.5.3 Interface 4 turned into DOWN state. Nov 27 2012 16:19:26 Quidway SNMP/2/IF_PVCDOWN:OID 1.3.6.1.6.3.1.1.5.3 Interface 32 turned into DOWN state. Nov 27 2012 16:19:26 Quidway %%01IFNET/4/IF_STATE(l):Interface Ethernet0/0/1 has turned into DOWN state. Nov 27 2012 16:19:26 Quidway %%01IFNET/4/IF_STATE(l):Interface Vlanif1 has turned into DOWN state. Nov 27 2012 16:19:26 Quidway %%01IFNET/4/LINKNO_STATE(l):The line protocol on the interface Vlanif1 has entered the DOWN state. Nov 27 2012 16:19:30 Quidway SNMP/2/IF_PVCUP:OID 1.3.6.1.6.3.1.1.5.4 Interface 4 turned into UP state. Nov 27 2012 16:19:30 Quidway SNMP/2/IF_PVCUP:OID 1.3.6.1.6.3.1.1.5.4 Interface 32 turned into UP state. Nov 27 2012 16:19:30 Quidway %%01IFNET/4/IF_STATE(l):Interface Ethernet0/0/1 has turned into UP state. Nov 27 2012 16:19:30 Quidway %%01IFNET/4/IF_STATE(l):Interface Vlanif1 has turned into UP state. Nov 27 2012 16:19:30 Quidway %%01IFNET/4/LINKNO_STATE(l):The line protocol on the interface Vlanif1 has entered the UP state. 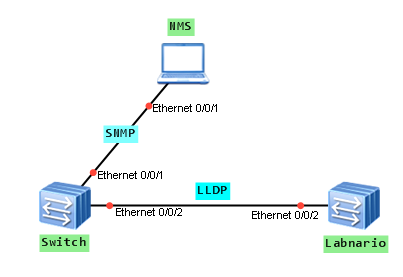 [LLDP-Evt] [LLDP_SH_CaptureEthPkt] get vlan(1) cut. [LLDP-Evt] [LLDP_SH_CaptureEthPkt] port 0x00000004 ready to handle lldp pkt. [LLDP-Evt]  The port(0x00000004) receive a lldp packet. If you want to test it on eNSP, unfortunately I was not able to do it. It looks like LLDP is not supported yet, even the necessary commands are available.